In a dim and faraway solar system, astronomers have for the first time discovered a rocky, Earth-sized planet that might hold liquid water -- a necessary ingredient for life as we know it. Two attributes make the newfound planet special. First, it's within its star's habitable zone. That's the range of orbital distances where a planet with an atmosphere could harbor lakes, rivers or oceans that wouldn't freeze or boil away. Second, the planet is about the size of the Earth. It's not big enough to accumulate a thick atmosphere of hydrogen and helium as gas giants like Jupiter and Saturn have. "One of the most interesting questions in science is whether life can arise on other planets or, alternatively, if life on this planet is unique. The discovery of planets with Earth-like properties is one important link in the chain required to answer this question. And the discovery of the planet Kepler-186f is an important step toward finding a planet that is like our Earth," said Fred Adams, professor of physics and astronomy in the University of Michigan College of Literature, Science and the Arts. Adams is a co-author of a paper about the discovery published in the April 18 issue of Science. He also was first author Elisa Quintana's thesis adviser when she was a graduate student at U-M. She is now an astronomer at NASA's Ames Research Center and the SETI Institute, whose mission is to search for extraterrestrial intelligence. Over the past two decades, astronomers have found some 1,800 exoplanets in other solar systems. Only 20 orbit their stars in a habitable zone. But these are all thought to be much larger than the Earth, according to a news release from the SETI Institute. The most likely candidates for habitable planets would be smaller than 1.5 times the size of Earth. The researchers were able to estimate the size of Kepler-186f by observing how the star dimmed as the planet crossed it. Adams, a theoretical astrophysicist, helped to interpret the results gathered with NASA's Kepler telescope, which searches for Earth-like planets. Data from the space telescope gave researchers estimates of the planet's radius and how long it takes to orbit the star. The researchers found that the radius of Kepler-186f is 1.1 times the radius of Earth and that the planet's year is 130 days long. Adams was part of the team that used the data to answer questions such as where the solar system's habitable zone is, what the planet is most likely made of, and whether it could hold on to an atmosphere, for example. "We found that this solar system does seem to be stable, it can be formed under reasonable conditions, and the planet is likely to be rocky, or Earth-like, and not gaseous," Adams said. First author Quintana says the system may be too dim for follow-up surveys to find the composition of its atmosphere, even with next-generation telescopes. "However, our research tells us that we should be able to find planets around bright stars that will be ideal targets to observe with James Webb," Quintana told SETI. NASA's Webb orbiting telescope, which is still being built, will be able to directly image planets around nearby dwarf stars, and use advanced techniques to characterize their atmospheres. The SETI Institute's Allen Telescope Array has been observing the Kepler system for signs of intelligent life. 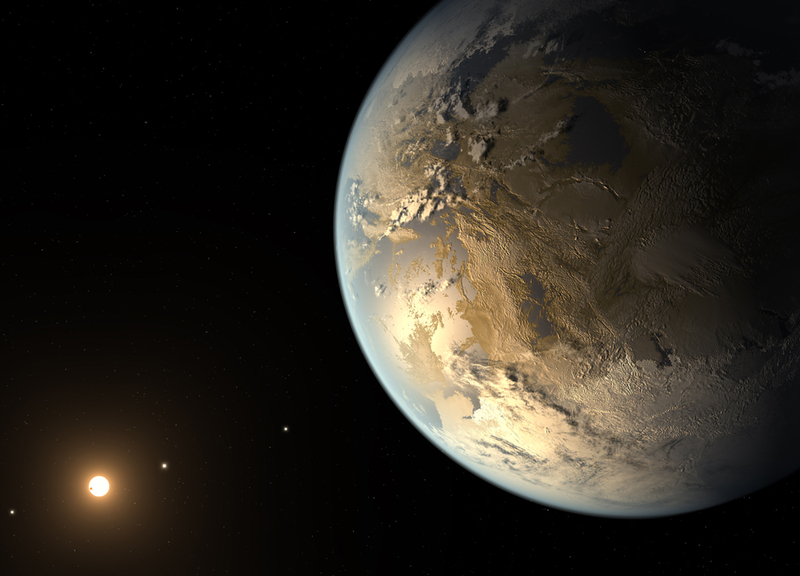 "An Earth-Sized Planet in the Habitable Zone of a Cool Star," Elisa Quintana et al., Science, 18 April 2014. The research is supported in part by NASA and the SETI Institute.